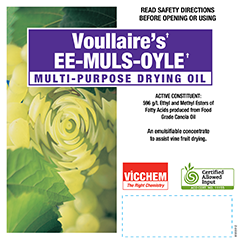 Voullaires  EE-MULS-OYLE is a Multi-Purpose Drying Oil used to assist the drying of grapes and other fruits. The active ingredients are based on ethyl esters which are the most cost effective materials to increase the rate of drying. This oil is formulated with a unique blend of emulsifiers that confers excellent emulsion stability to provide easy and reliable emulsification at the point of use. To retard water loss many fruits have a hydrophobic (water repellent) surface that is made up of over-lapping wax platelets. The active ingredients in Voullaires' EE-MULS-OYLE modify the waxy surface of treated fruit. This modification is a rearrangement of the wax platelets which facilitates the movement of water from the fruit to the surrounding atmosphere. Always follow the directions for use on the label. Suggestions for use Avoid applying to immature fruit of less than 22º Brix For even-drying, the fruit must be completely covered with emulsion. To help ensure this, emulsion may be reapplied 4-5 days after the initial treatment. However, drying time is retarded by additional unnecessary applications of emulsion. If rain occurs within three days of spraying and removes a significant amount of emulsion, it should be reapplied. Avoid Spraying at low ambient temperatures (150C). Apply emulsion within 4 days of cane cutting or vice versa.